Some girls fall asleep imagining their dream wedding. I fall asleep imagining my dream pantry. My dream finally came true, and our tiny little pantry doubled in size. The before and after will blow your mind! I cook a healthy dinner for my family every night. Twice a month, we will order pizza or go out for dinner, but for the most part, Mamma cooks. We eat healthy, and we go through a lot of food. The pantry was stuffed to the gills, not functional at all, and was in extreme need of an update. 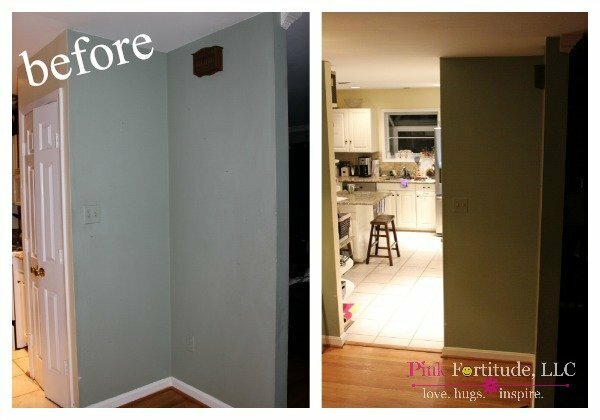 Other necessary home projects came first, so I was a happy camper when it was time for the pantry makeover. 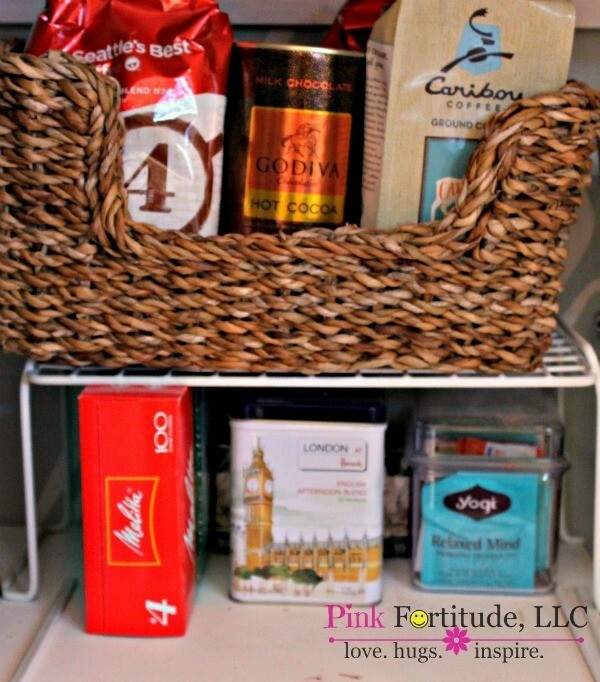 I had been collecting pantry inspiration on Pinterest and also on Houzz. Words cannot describe how happy I am with the transformation. Are you ready for the before and after? The pantry was set up with square shelves and measuring 25″x20″x96″. It was difficult to find anything, even despite my best attempts at organizing. The room beside the kitchen used to be the original dining room, until a dedicated dining room was added to the house back in the 1980’s. This room is one of those small bonus rooms, and we use it as a library. It has a weird, awkward corner with not much purpose. Perfect for the pantry expansion! We (“we” being our PM Chris and his men who completed the project) knocked down the wall and pushed the existing pantry out into the awkward space, making it over twice the original size. The wallpaper is from Target. Did you know that Target carries their own line of wallpaper? It’s similar to contact paper, sturdier like a wallpaper, and relatively easy to install.. The new pantry has doubled in size. Are you ready to peek inside? The pantry is now more than double the size, measuring 25″x46″x96″. Instead of square shelves, the new pantry has “horseshoe” shaped shelves so you can actually step into the pantry to retrieve your items. While I could easily edit 90% of the items in the pantry and show you pretty pictures of one box of cereal and two bottles of Perrier, that’s not me. I’m not going to show you beautifully staged “after” photos. You get the real me, and a real pantry that a real family uses. A lazy susan is my favorite go-to. Baskets easily corral pouches, bread, chips, and other unstackable items. The majority of the storage containers came from The Container Store, and I purchased a few more to compliment the existing set. The chalkboard labels are from Amazon.com. 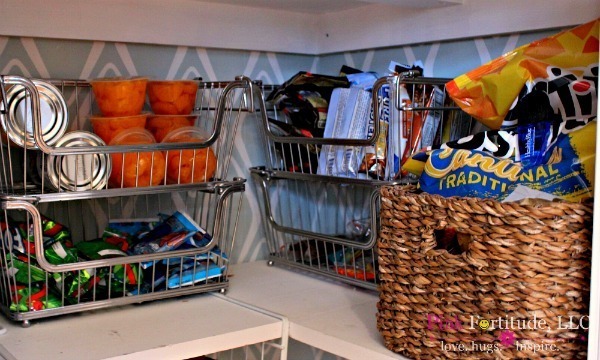 Stepson’s lunch items and snacks are kept in one place with stackable wire baskets. A riser and basket are all that are needed for a coffee, tea, and hot chocolate vignette. Hubby – “Where’s the coffee now?” Me – “It’s in the coffee, tea, and hot chocolate vignette.” Hubby – “Um… it looks like a basket to me.” Smile. 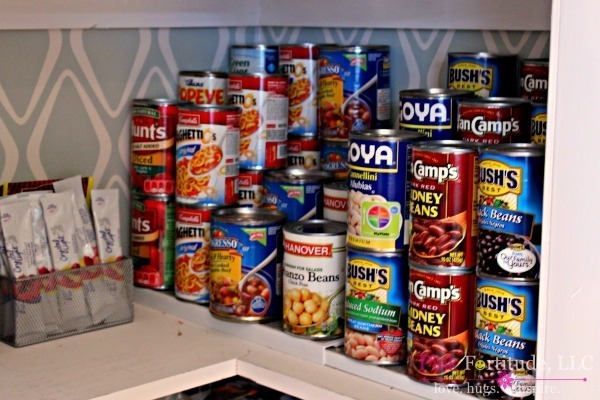 Three tiered expandable risers from The Container Store make organizing canned goods a breeze. When the pantry was finished, Hubby offered to help put the food back. I graciously thanked him, but this is something I’ve been looking forward to for a long time. This is my happy place. There are days I open the door and just look in. I still can’t believe it’s finally complete. Ooohhh. Not quite complete. The floor will be replaced when the kitchen floor is replaced in the next month or so, and I’m still working on some more DIY organization projects for the top of the pantry and the bottom. Soooooo….. what do you think? This looks great, I love the wallpaper! 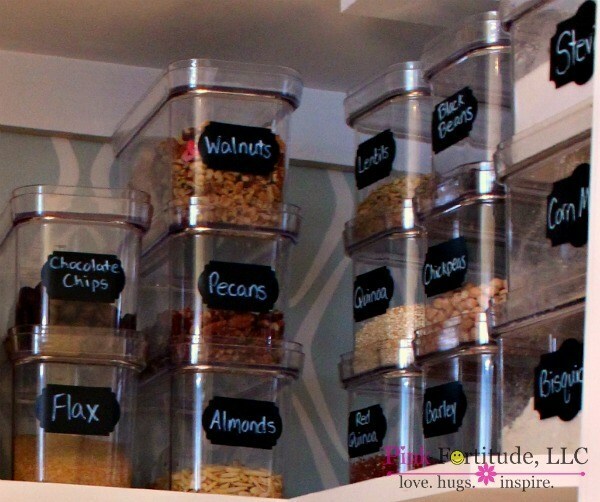 I wish my pantry was this cute and organized, one day…. 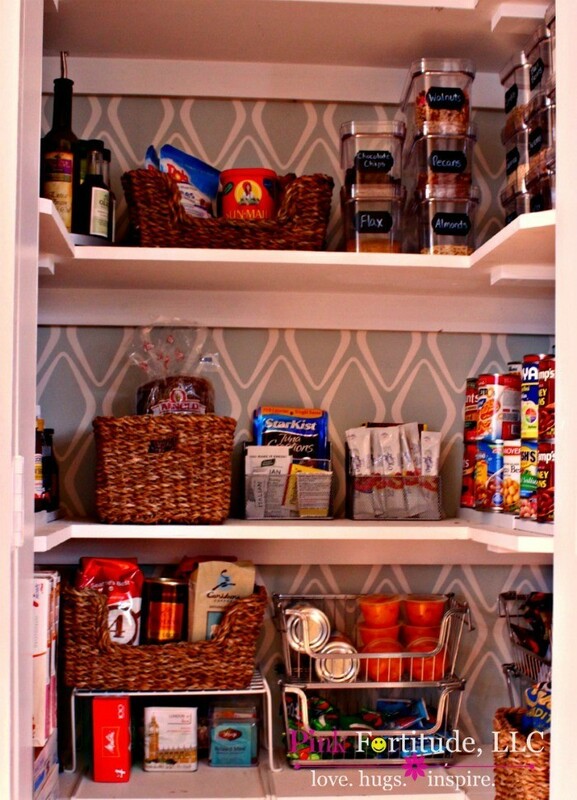 I want my pantry to look like this! I shared this on Facebook. I love it!! Holy cow, Holly, this looks BEAUTIFUL! 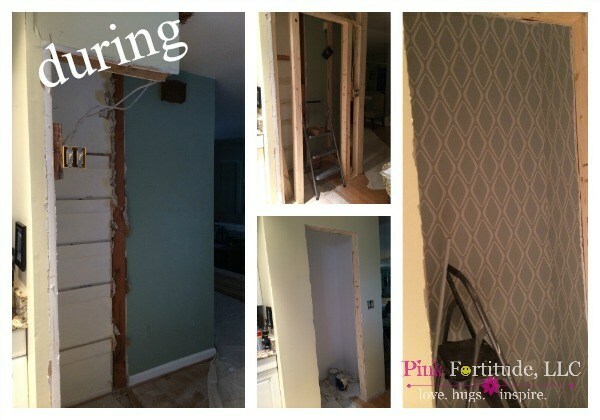 Now you’ve got me thinking about knocking down walls… heehee =) Glad your pantry dream came true! Looks really nice plus I like your wooden shelves. Your pantry is pretty much designed like mine but I have them terrible metal shelving that you would find in some closets but like to replace with wooden shelves. Someday in the near future I hope. Oh, Holly, it’s so lovely! 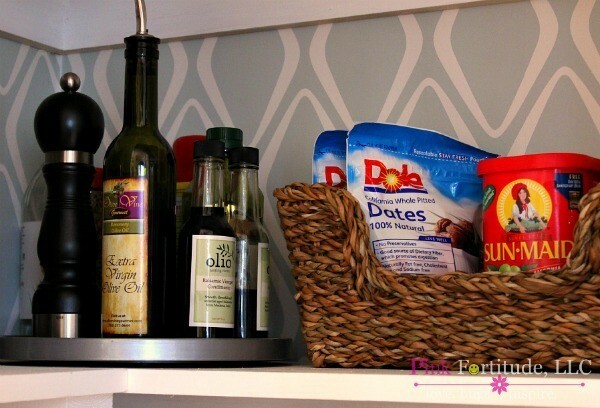 I want your pantry, complete with fun wall paper and cool stackable baskets. I so get why you didn’t let the hubby help you put everything away. I know you do a little dance every time you open that pantry door. I love your pantry. It was small like mine is but I love the u-shaped shelving. However, my absolute favorite is the wallpaper. It is gorgeous. I can understand why you are in pantry heaven. Looks beautiful! FYI: once you open a box of flax it should be stored in the frig. Not only are they organized, but the look beautiful! Great job! 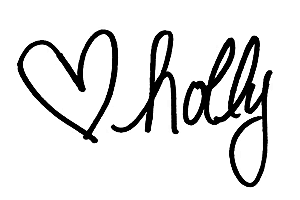 Thanks for sharing at the Pin Junkie link party! Have a good week! could you tell me what the shelves are made from? they look like they might be laminate? 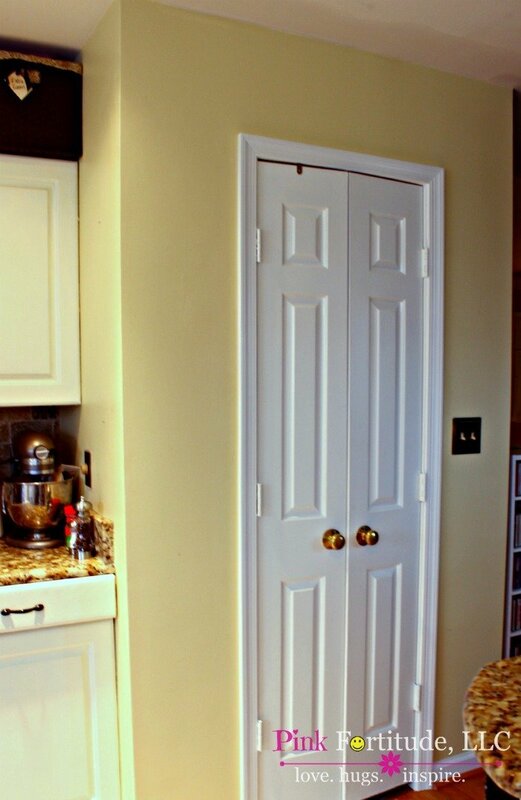 we are planning a pantry make-over and will do the u-shaped shelves with a lazy susan in each of the corners. i currently have wire shelving so this improvement will be heaven. yours is beautiful and i’m sure you love it! It’s beautiful and so functional! I know you’re loving your new pantry. Wow what a great space now….the wallpaper is beautiful and I am glad you took real photos, well done! Wow, that really is a dream come true. Thanks tons for linking to Inspire Me. This looks fantastic! 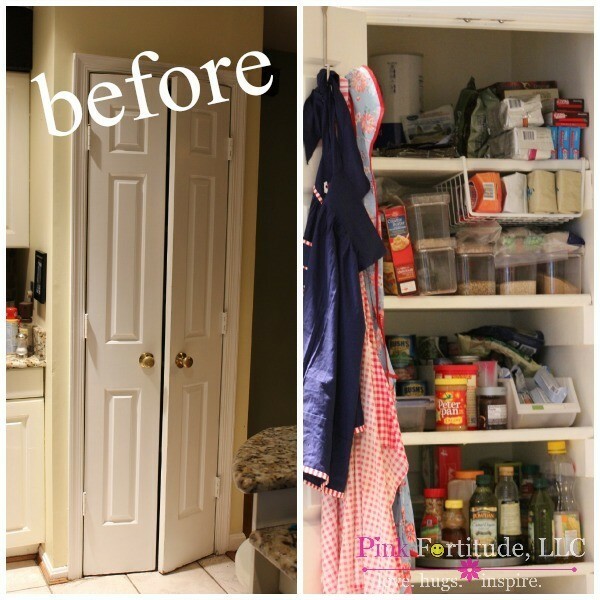 I wish I had a nice pantry like that- ours is so small and terribly disorganized. I love it. We hope to do something similar some. We’re getting rid of our heat/cool system and are going to turn the empty space into a pantry. Thanks for the great ideas. 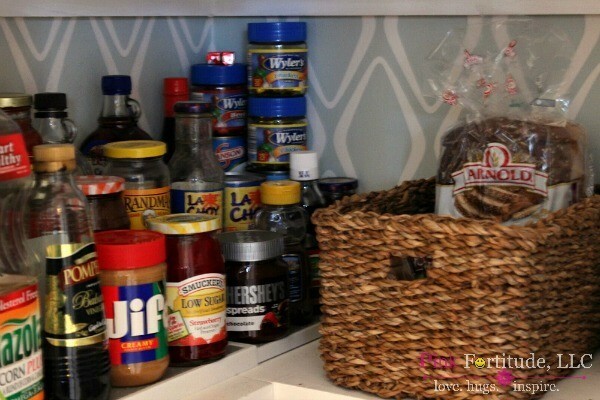 You know how much I love a good pantry organization project and yours is amazing, Holly. It must make you happy every morning when you pull out your cereal box. Thanks for sharing at the This Is How We Roll Link Party at Organized 31. Love this makeover! The wallpaper isbeautiful and I love the assortment of containers you used! I’d love it if you’d link up with us at Talented-tuesday-link-party that is on the blog now!